Tired of that old yo-yo weight-loss/weight-gain cycle? Lose it for life! 'Every other diet I've tried ends in despair; Steve's plan ends in hope!' Most weight-loss plans will help you drop a few pounds, but for how long? You deserve better. You deserve Lose It for Life, a time-tested, uniquely balanced program that deals with the physical, emotional, and even spiritual elements that lead to permanent weight loss. Even if you have already experienced some success on another weight-loss program—Atkins ®, South Beach ®, Weight Watchers ®, whatever—this audio will give you the information and motivation you need to achieve a permanent “state of weightlessness,” which is the secret to lasting results. Now, endorsed by Florida Hospital as part of its Healthy 100 campaign, this deluxe edition audio offers a wide variety of exercises and activities to lead you to the next level in understanding: • why you do what you do; • how you can shed bad habits for good; • how, with the help of God and others, you can develop a whole new approach to life, to eating, and to living healthy and free! 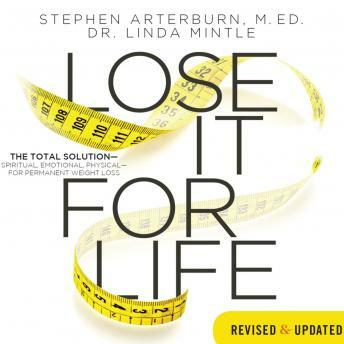 Lose It for Life was developed by best-selling author and radio personality Stephen Arterburn, who lost sixty pounds twenty years ago and has kept it off. In this revolutionary audio book, he and Dr. Linda Mintle, who is known for her clinical work regarding weight issues, will help you accomplish what you desire most: permanent results.